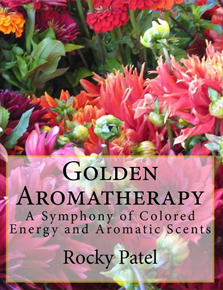 Golden AromaTherapy reveals for the first time information on the energetic properties, colored energies, and chemicals within essential oils. We love to share with our readers how to get the most out of 48 essential oils by understanding their colors, or energetic vibrations and the specific beauty & health, emotional, mental, and spiritual issues that they address. The details specifies how to apply the oils for the greatest benefit. We offers countless recipes for mixing these essential oils for oil blends, sprays, salt scrubs, salt baths, lotions, and energetic cleaning sprays. You will find discussion which oils care for your skins, purify and prepare the energetic body for meditation, and prosperity, and which oils enhance romantic relationships.